If you’ve found out that your solar PV system isn’t working properly, or at all, it’s probably come as something of a shock. Many systems were sold with false promises of 20+ years maintenance-free, and just a few years in you find yourself facing a repair bill. Most problems where the inverter is not at fault are down to poor workmanship by the installers. You may find that the original installer is no longer trading, and that your workmanship warranty insurance isn’t worth the paper it’s printed on. Terms and conditions: This fee covers up to two hours of labour and is for work within a reasonable travelling distance of our location (we’re in Chorley, Lancashire). We are happy to consider working outside the area but a reasonable charge would be made to cover the additional fuel and time. If your system is repairable within the two hours, you would be charged for any parts used. If we need to replace the inverter or another part not held in the van then we will need a second visit. In these cases we will usually be able to offer a fixed price quotation for the repair. If access to the roof is necessary then a further visit may be necessary to erect a safe means of access. Note: If you’re considering installing solar panels, please do not be put off as a result of the information on this webpage. A well installed solar PV system using quality products will give many years of trouble-free service and the majority of problems that are not inverter faults are down to poor workmanship. By carefully choosing a competent installer, many of these problems can be avoided. If the inverter is out of its warranty, we will quote for a good quality replacement with a ten year warranty. There are also upgrade options available for a premium system with a twenty year warranty that will outlast your Feed in Tariff. This is the second most common fault, and it tends to manifest itself when a system with incorrectly made d.c. connections has been exposed to a few years of our changeable British weather. The standard of workmanship in many installations is exceptionally poor, with connectors not fitted correctly and cables not kept supported off the roof surface. You can often see this from the ground by looking underneath the solar panels. 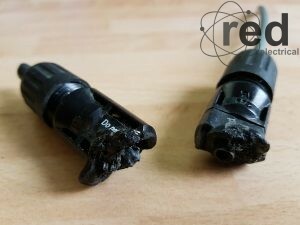 Badly fitted connectors allow water ingress, which leads to corrosion. If the cables and connectors are in contact with the roof surface, it is likely that they will accumulate organic debris such as leaf mulch and (particularly near the coast) bird droppings. As this biodegrades it releases ammonia, which will penetrate the connections and accelerate corrosion. Some arrays also suffer from uninvited guests such as pigeons or gulls – click here for further information about bird infestations and our permanent solutions. In some other installations, we have found that the strings are connected incorrectly, i.e. including panels from more than one roof orientation on the same d.c. string. The effect of this is that the solar panels work against each other resulting in much lower yields than expected. Most solar PV systems are on the roof, meaning that a scaffold is usually required for remedial work. 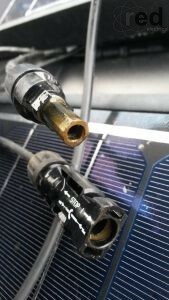 Due to the cost of having these faults repaired many customers choose to upgrade their panels with SolarEdge power optimisers at the same time. This has many benefits including better system performance and unsurpassed monitoring of every part of the solar PV system. We then also give them a twenty year warranty and offer ongoing remote monitoring of the system, effectively taking the customer’s installation under our wing. If your system is tripping the circuit breaker, it could be that the installer has fitted the wrong type of circuit breaker, which we can replace for you. Although quite rare, the FIT meter can fail and either stop counting up or (in the case of LCD devices) have a blank screen. Isolators can suffer thermal damage, usually as a result of loose connections or putting in the wrong type of isolator. We have even found cases where installers have fitted an a.c. isolator where a d.c. isolator should be, which are often burned out. This is a fire risk. As we carry all these components in the van, these faults can usually be resolved in one repair visit. Is your roof letting the rain in? 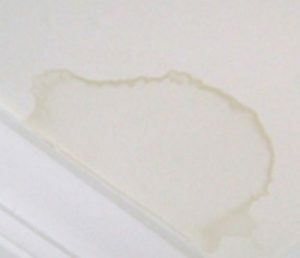 Finally, your solar PV system may be working very well, but you’ve discovered a stain on your ceiling because the rain is getting in. A correctly fitted roof mounted solar array will never leak in. If you have this problem then we need to inspect the roof and quote for a permanent repair. This often necessitates reinstalling or replacing the mounting structure of the solar panels and will be costly. We are often asked if we will do a ‘quick fix’ with sealants or flashband. We aren’t interested in ‘bodge jobs’ so if that’s your style, please look elsewhere. Effective system monitoring is an area that has often been ignored, particularly in earlier systems when fewer monitoring products were available. 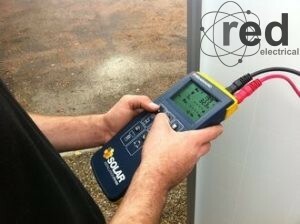 Simply relying on your meter readings means that discovering a fault with your solar PV system may take several months. With a personal display you can see your yields instantly. We can retrofit monitoring systems from simple displays to remote meter reading systems (useful for landlords). If you have a hot water cylinder then why not ask us to install an immersion heater controller to maximise your energy savings? Click here for more. SolarEdge technology increases system yields and provides unrivalled system monitoring, including every panel’s individual performance. With unsurpassed reliability and a 20 year warranty, it is an excellent upgrade. If you feel confident that you know what you require and that you can rectify it yourself, you may wish to purchase replacement parts from us. We can supply any replacement part that you require, including inverters, isolators and meters. There are many inverters available in our Online Shop, or if there is something not listed please get in touch.